Many thanks to Linda Fairbrother for the photos and for the report below. There were rather more sweaters and coats than one might expect in the spacious Club room at Holyport over this weekend. Sitting in the dedans was a chilly experience, what with freezing temperatures outside and a remarkably non-hot radiator struggling to cope. So the 16 players and various spectators either ventured in just for short bursts, or kept – relatively – warm behind the glass to support the players through body language only. Luckily, the excellent TV screen in the Club Room, linked to the marker’s tablet, kept everyone up-to-the-minute with the score. All Singles games played level, three full sets. Play began on Friday and the very first match on court was perhaps the most contested match of the whole tournament: Sarah Parsons against Sarah Brownlee, supposedly separated by 4 handicap points but you wouldn’t have known it. In the first game alone, there were 6 chases laid, and it took one hour and forty minutes of stunning tennis for a winner to claw her way to the finishing line: Sarah Brownlee 6/5 3/6 6/4. 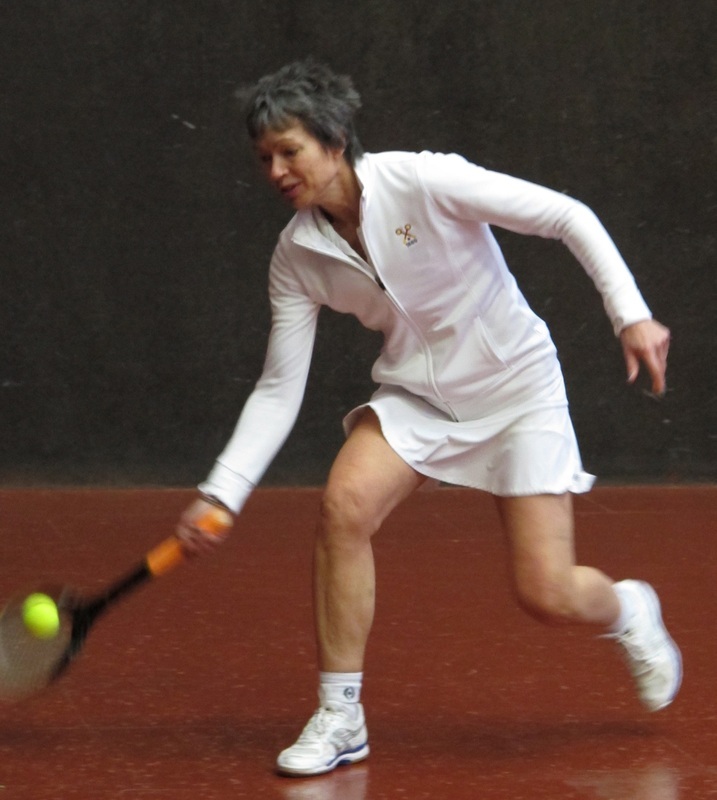 The next match was also a three-setter, with new LRTA member Karen Pearce making a good show against Linda Sheraton-Davis, winning 6/3 4/6. Katy Weston, with a hand injury, struggled against calm and steady Hazel Dunn. She was up 4/2 in the first set, but Hazel weathered that and glided through 6/4 6/0. 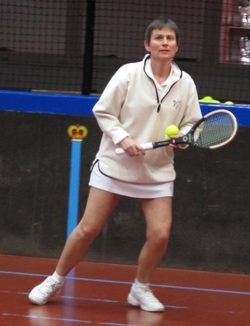 The final Friday match saw Karen Pearce back on court, this time with an even bigger handicap difference of 9 points against her. At first all looked hopeless when her opponent Sarah Backhouse romped ahead to 5/0 with excellent cut shots. But Karen was learning a thing or two, and clawed back to 5 all, before losing the set 5/6. Sarah won the second set 6/2, and the match, but Karen made an impressive effort. On Saturday, Sarah Brownlee was back on court, in the second round, against Maggie Henderson-Tew. This was a quality match, with many deuces, and the eventual score does not reflect the tennis – 6/2 6/2 to Maggie. Gabrielle Smart now took on Lucy Davies, It was a close match with good steady hitting from both, and few unforced errors. Gabrielle had the edge with her serves, while Lucy was retrieving with some amazing shots in the rests. Gabrielle used a spinning bounce to help her win the first set from deuce at 5/5. This didn’t dishearten Lucy who continued steady as a rock, and all was even up to 3/3 with play being all about placing by both, with good rests being ended by shots carefully placed either wide or near the nick. However, Gabrielle just edged ahead with some excellent serves, and won the match 6/5 6/3. 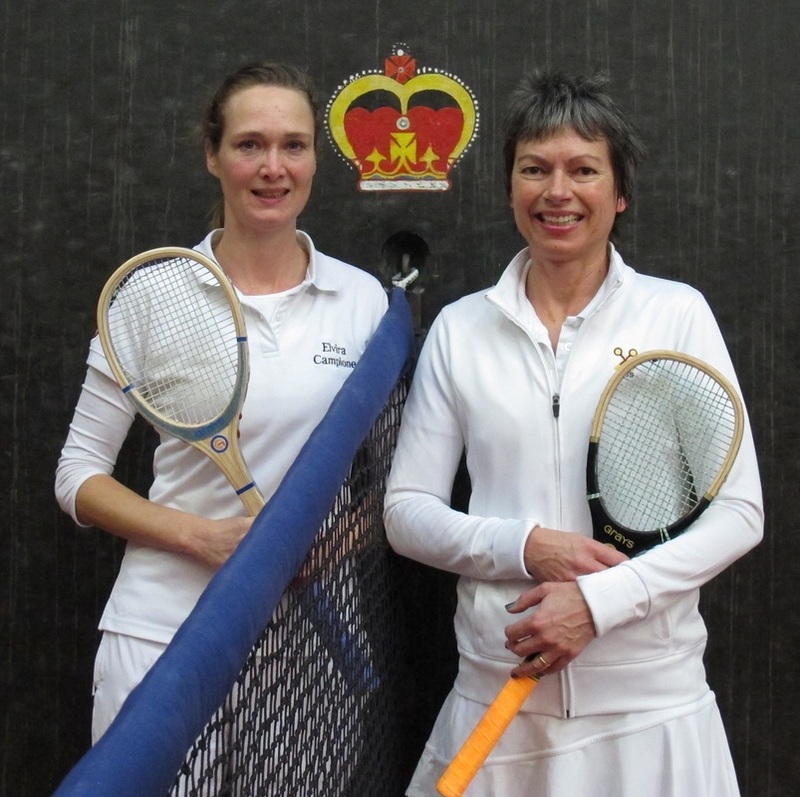 Hazel Dunn was out-classed, not surprisingly, in her 2nd round match with Elvira Campione. 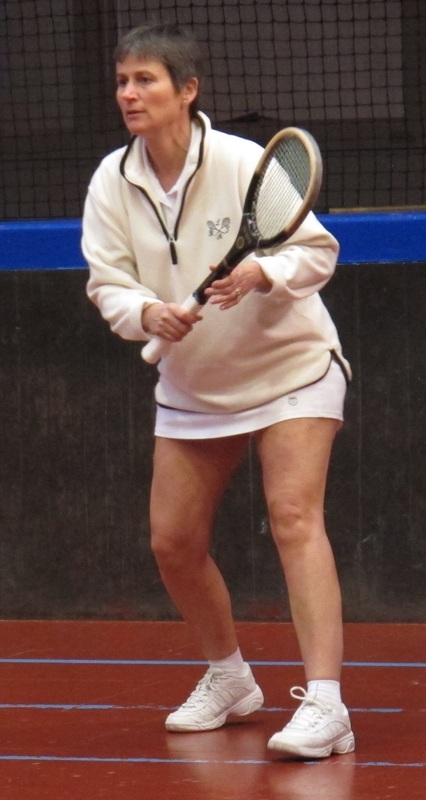 She got stuck at the Hazard end for most of the time, and manfully tried to get the ball back, but Elvira’s low powerful ground strokes were just too overwhelming, and Elvira progressed to the third round, 6/0 6/0. 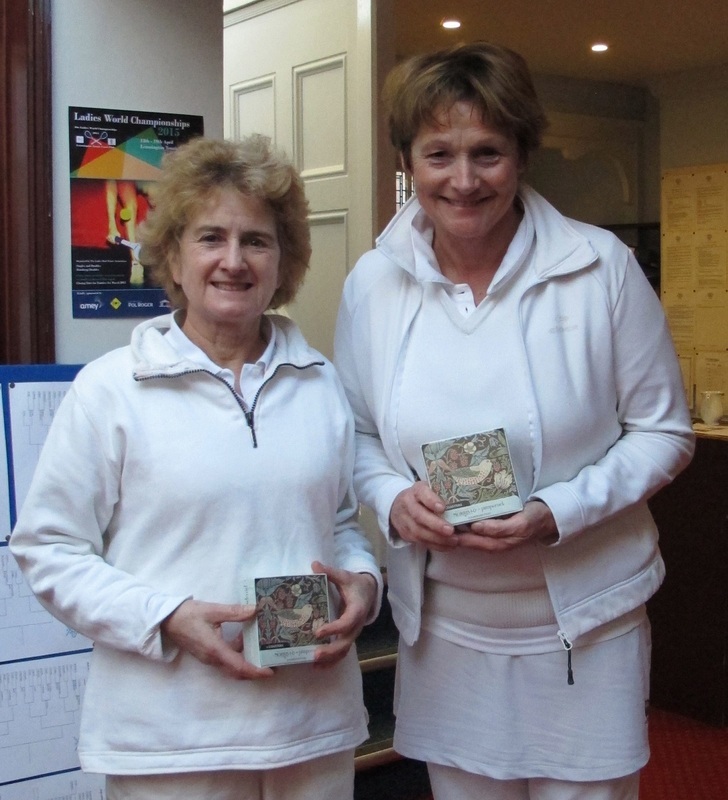 The last 2nd round match was between Linda Fairbrother and Gabrielle Smart. Linda was hitting well, and untroubled by Gabrielle’s serves, she quickly took the first set 6/0. Gabrielle then began to fight harder, and hit back Linda’s serves with interest whenever she could. Rewarded with two games, she kept trying, but Linda buckled down and shut the door, taking the match 6/0 6/2. Things began to get interesting with the third round matches. Alex Garside, one of the two former World Champions (Doubles) in the tournament, came on court against Sarah Backhouse on Saturday morning. Some powerful hitting by Sarah was not enough to trouble Alex, who took the first set 6/1. At 3/0 in the second, Sarah was 0/40 down, but fought like a tiger to get to deuce and then her Ad. But a double fault by Sarah let Alex back in to win that game eventually, and though Sarah hung on to make Alex play the points, she couldn’t hold her off. Alex through 6/1 6/0. A mouth-watering match was that between Tiff Fielden and Elvira Campione. On paper, Tiff should win, with a handicap 5 points lower than Elvira’s. But in their previous meeting, Elvira beat Tiff – so what would happen this time? Tiff began well, going to 3/0, but then after a game with 6 deuces, and many chases laid by both of 2 or better, Tiff just lost a chase of worse than 2, giving Elvira her first game. Things then went Elvira’s way to get up to 4 all, with deuce after deuce, till finally Tiff managed to swing the set 6/4. In the second set, Elvira’s double-handed backhand was working beautifully and she was edging on top. Both were looking tired by this time, but though Elvira was doing well, she seemed to be getting frustrated, shouting and appealing to the heavens. However, the second set went her way, 6/3. Third set went for Elvira all the way, with Tiff losing out on longer rests which usually finished with a screaming shot to a corner from Elvira. She knew she had to keep shots low to prevent this, and that meant too many shots just a few inches below the net. The deuces kept coming, and so did Elvira winning the game points, to take the third set and the match, 4/6 6/3 6/1. A fine match. The following two matches were more one-sided affairs. 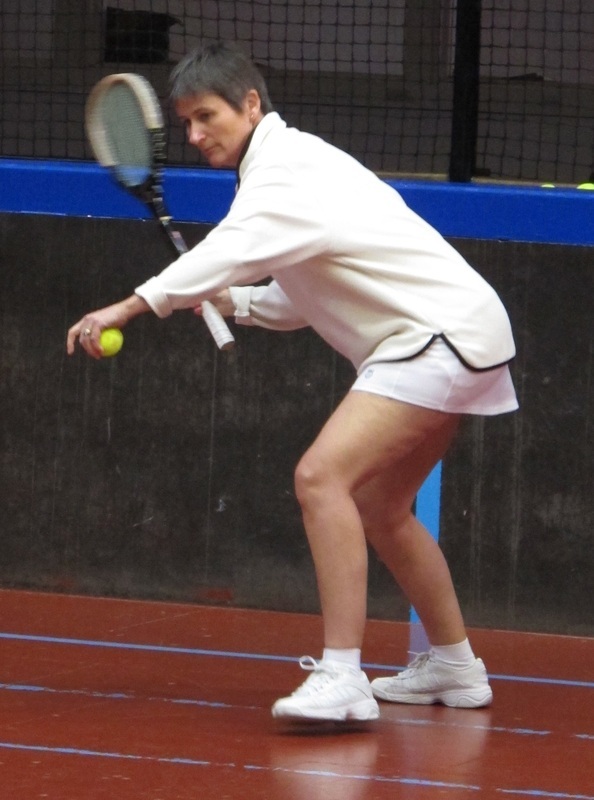 Maggie Henderson-Tew got down really well to Penny Lumley’s serve and defended the tambour heroically. But the former World Champion was far too classy, and though Maggie won plenty of points, she couldn’t get any games. By the second set, Penny was spanking the ball around so successfully that Maggie was finding it hard even to win any points, and you could see the spirit being sucked out of her, though she still kept trying. But Penny goes through 6/0 6/0. 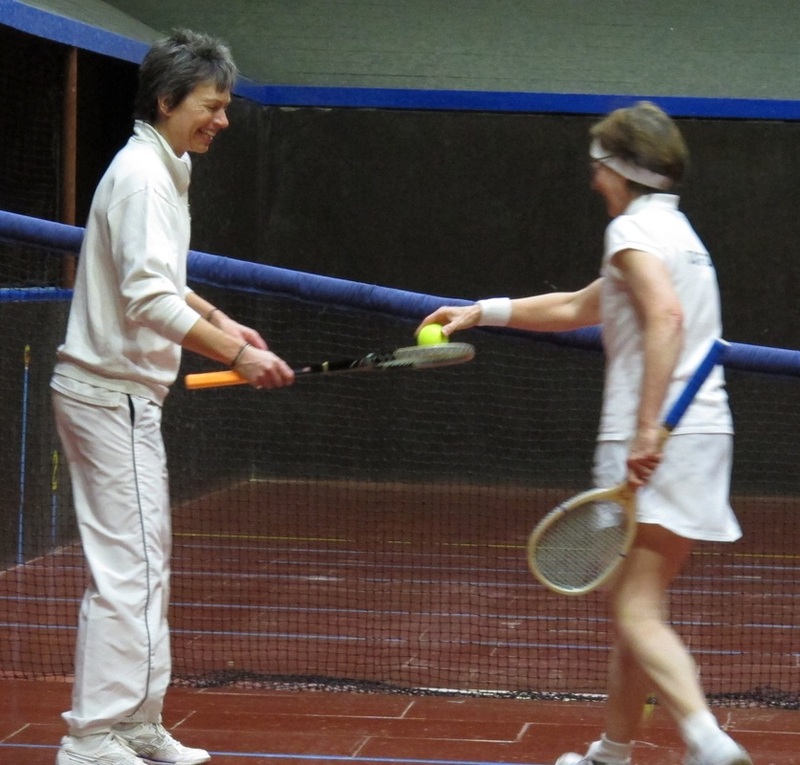 A similar story with Jill Newby against Linda Fairbrother, though Linda managed to get a few games in the second set. Good placing into the corners, and fine serving, gave Linda little chance, though she made Jill play the points. Jill through 6/0 6/2. In the semi-finals, Elvira had the honour of playing Penny, and came out in a blazing whirl of volleying arms and stretching legs. But Penny answered with a variety of shots – cross-court volleys, slips up the side, swings off the wall – taking away Elvira’s chances to attack back. The only shots that Penny didn’t return were Elvira’s scorching two-handed drives into a far corner, and as often as not they were laying a 5 or 6 yard chase, which Penny would later calmly win from the Hazard end. At 5/1 Elvira was finally rewarded with a game, and looked close in the next, but it was not to be, and Penny took the first set 6/1. It was a similar story in the second set, with Elvira giving it her all, but getting barely a sniff at any game points. However, a supreme effort at 3/0, when Elvira laid two superb chases, and then volleyed to the base of the tambour, brought her another game. At 5/1 she won another, but she had to play like a demon to get these games. It all seemed very unfair when Elvira was playing so well, and right up to the final game she kept trying, even managing to wrong-foot Penny at one point, which you don’t see very often. But to no avail – Penny went through 6/1 6/2. The talk in the dedans passed to clothes moths and their pesky habit of preferring one’s favourite sweaters to less attractive alternatives. What did they eat before cashmere was invented? Jill Newby took on Alex Garside next. First blood to Jill, to go up 1/0, but Alex then got into her stride, hitting beautifully into the corners. She rolled up the games, cunningly stretching Jill into errors. She also used the side wall well, curving off the wall into the far backhand corner. The first set passed by, 6/1 to Alex. In the first game of the second set, Jill came out firing, and went 30/0 up. But hope was snuffed out with three perfectly spinning railroad serves (“That twisty serving action would put my back out,” commented someone in the dedans admiringly). And so another match continued where one person was working her (nice white) socks off, getting two or so points in most games, but seldom getting to a game point, never mind a game. Finally, at 4/0 to Alex, Jill did get herself not one, but two, game points. But first a net cord, and then a high ball that just hit the top bandeau, meant she couldn’t convert either to a game. At 5/0, Jill kept in the match as best she could, but Alex finished things off with an emphatic shot to the grille. She went through to the final, 6/1 6/0. No one was surprised that the two former World Champions met in the Final: Alex against Penny. Penny began totally ruthlessly, in a display of ice and fire: ice-cold in concentration; fiery in execution. Alex did put her nose ahead in some games, with forces to winning openings, or beating excellent chases. Anything less and Penny won the point. But it proved impossible for Alex to close off the game points, and Penny took the first set 6/0. In the second, the same story, with it seemingly impossible for Alex to win from however favourable a position. There were five games in a row where Alex was ahead 30/0 or even 40/0, but she won none of them. Not surprisingly, she began to look a bit despondent at 4/0, especially when a shot by Penny just hit the nick and bounced flat to win Chase better than 2. At 5/0, Penny hit the grille; hit the base of the tambour; hit the grille; and finished things off with a superb cross-court shot that bounced up four inches high to land under the winning gallery to win the match, 6/0 6/0. It was a superb display of tennis. Penny retained her Masters title, apparently almost without sweat. 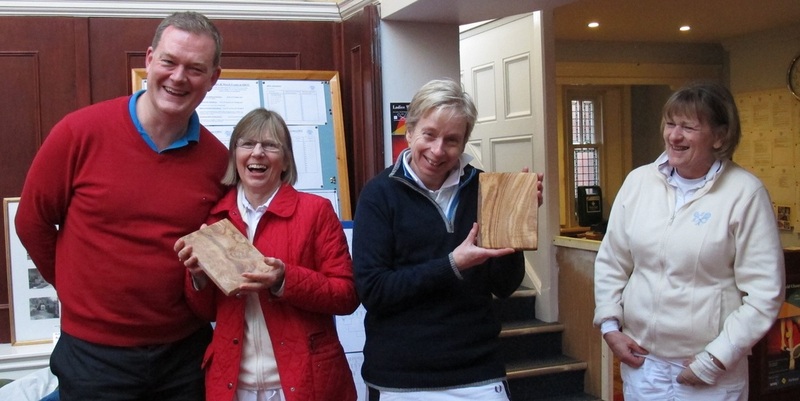 In the Handicap Doubles Plate finals, there was a bizarre match-up of Sarah and Linda v Linda and Sarah. 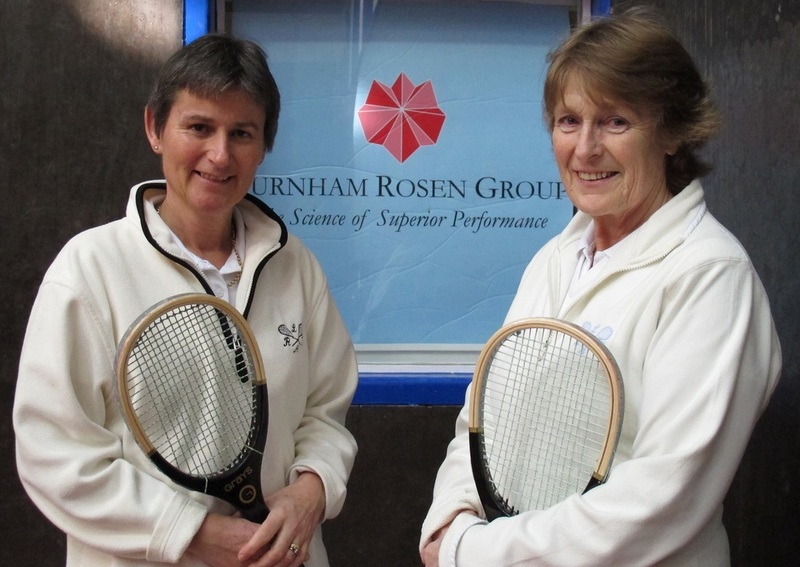 Sarah Brownlee and Linda Sheraton-Davis beat Sarah Parsons and Linda Fairbrother, after the latter pair apparently had it in the bag at 4/1, playing confidently with strong ground strokes and serves. But their opponents had other ideas, chiselled away, put the spooks up the other pair, and came home 8/6. 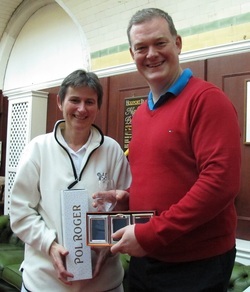 Our thanks also to the markers, John Evans and Simon Marshall, to Burnham Rosen for their sponsorship, Sheila Macintosh for providing the prizes for the Masters winner and finalist, to Colm O’Shea for presenting the prizes, to Jill Newby for organising an excellent dinner, and to Katy Weston for her catering and excellent organisation of the tournament.